Also known as Bealtaine, Walpurgisnacht, May Day, (Northern Hemisphere) & Novey Eve (in Southern Hemisphere). 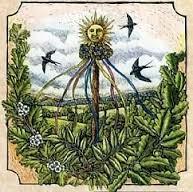 Beltane, the beginning of the summer months is at the November cross-quarter. This is the festival of the Great Rite - of sexual union between Goddess and God. Beltane is the spring fertility festival and there is feasting and celebration - a great festival for lovers! Beltane is the most popular time for Witches to be handfasted. This is the time when the brilliant red flowers of the Flame Trees highlight Australian forests and gardens. Our famous horse race, the Melbourne Cup, is happily coincident with southern Beltane, being run on the first Tuesday in November and taken as an unofficial holiday across Australia.